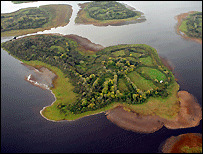 A small island in Lough Erne is up for sale. The new owner can even boast he is following in the nifty footsteps of an Irish dance legend. Lord of the Dance Michael Flatley recently turned Lord of the Isle, having bought his own plot on Rossmore Island, Kerry, for the princely sum of about £4m. In comparison, the price tag on 20 acres on Innishturk Island, Lough Erne, is a snip at just £695,000. Estate agent David Menary of BTW Sheils said opportunities like this do not come up very often. "It is very rare to sell an island. It happens maybe once in 25 years," he said. "From Innishturk, Lough Erne, the view is said to be one of the best as it is reputed to be the higest of the 365 islands on the lough." John Reihill, who grew up on Inishcorkish, can vouch for that. The boy next door said the neighbours had a magnificent spot. "We were always jealous, they had such a lovely island compared to us. It is one of the highest islands, the scenery is magnificent and the view is just beautiful," he said. The site used to be a 20-acre farm. But, say the estate agents, if planning permission is granted, it could be a private retreat, a special holiday home, an activities centre or even a farm once more... any dream will do.